Pioneering - Harrogate's new parking app will be the first in the UK. Harrogate drivers may have to pay a fee each time they park using a pioneering new parking app. 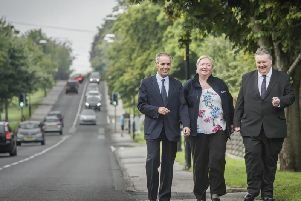 Harrogate Borough Council has been working in partnership with AppyParking, North Yorkshire County Council and Visa to deliver the UK's first real-time parking availability and frictionless payment solution to the streets and car parks of Harrogate town centre. The new 'smart parking' app will offer motorists the chance to be guided to available spaces and pay for exactly the time they stay. Start and pay for sessions with a single click. Automatically end sessions when driving away. Entering and exiting multi-storey car parks with registration plate recognition. But this ground-breaking new system which involves drivers paying per minute (subject to a minimum time) may also require each time a 30p convenience fee. The fee is designed to cover the operation cost so that the local authorities receive the full revenue from each parking session - as typically happens for all cashless parking app solutions, or food delivery services, often, too. When will parking app go live? The black sensors have already been implanted in parking bays in Harrogate - in total 1,600 surface-mounted BlueTooth sensors in all street parking bays and off-street surface level car parks. As a result, the new app is set to go fully live in Harrogate in January 2019. While drivers will still be able to pay by the hour at parking payment machines, those with the AppyParking phone app will not have to predict how long they will be in the bay and the session automatically ends when the car leaves the bay. The introduction of this new advanced technology will be funded by Visa and AppyParking in Harrogate at a total cost of £200,000.